SAN JOSE, Calif. (AP) — Ken Hitchcock knows the routine well by now as he begins his tenure as new coach of the Edmonton Oilers. For the fourth time in his long coaching career, Hitchcock has been tasked with taking over a struggling team in the middle of the season. Hitchcock was hired Tuesday as coach of his hometown Oilers after the team fired Todd McLellan with the team languishing in sixth place in the Pacific Division. The Oilers have lost six of seven games, getting outscored 27-11 in those losses, in a rough start to McLellan’s fourth season behind the bench. The team missed the playoffs in two of his previous three seasons despite having superstar Connor McDavid on its roster and the Oilers were just 9-10-1 entering their game Tuesday night at San Jose. McLellan is the fourth coach to be fired already this season, following John Stevens in Los Angeles, Joel Quenneville in Chicago and Mike Yeo in St. Louis. The Oilers are ahead of only the Blues and the Kings in the Western Conference standings. Hitchcock is the third-winningest coach in NHL history with an overall record of 823-506-88-119 (.603 winning percentage). 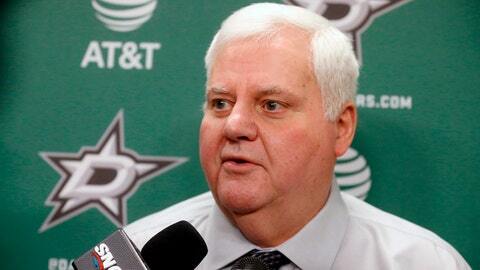 He has guided teams to eight division titles and twice to the best record in the NHL and has an 86-82 playoff record. St. Louis made the playoffs in each of Hitchcock’s five full seasons, reaching the Western Conference finals in 2016. The Blues abruptly fired Hitchcock in February 2017, cutting short what was already going to be his last season in St. Louis. He returned to Dallas with the hope of getting the Stars back to the playoffs but a late-season slump kept them out for the second straight year and the eighth time in 10 seasons. In April, Hitchcock said he was retiring for good but changed his mind when the chance to coach the Oilers came up. He pointed to the chance to coach in his native Edmonton in an organization with many people he has worked with in the past, including with Chiarelli on Team Canada in 2014 as a reason to come back. Hitchcock said he also looks forward to coaching the 21-year-old McDavid, who has won the past two scoring titles. There is plenty of blame to go around for the lackluster start in Edmonton by a top-heavy roster led by McDavid and Leon Draisaitl. Chiarelli traded winger Taylor Hall to New Jersey for defenseman Adam Larsson in June 2016, and then signed forward Milan Lucic to a seven-year, $42 million contract a few days later. Hall won the Hart Trophy as league MVP last season, while Lucic has two goals in his last 66 games.